Claim your 50% off Economy pork set in 3 simple steps, then you may redeem it on 24/7/2017 (Monday) !! Only valid for first 100 customers!! Like BarBQ Plaza Malaysia Facebook page. 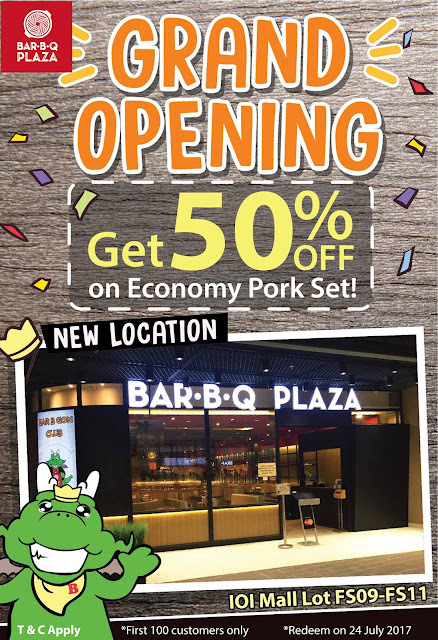 Share this post with caption "Let's go Bar B Q Plaza IOI Mall New Location Grand Opening - Lot FS09-FS11"
Valid for the first 100 customers only. Each customer entitle for 1 x 50% Economy Pork Set redemption only. Offer cannot be combined with any other offers, promotions, vouchers. Bar B Q Plaza reserves the right to change or cancel this promotion scheme. 在这贴文按赞，并分享出去，标题为 "Let's go Bar B Q Plaza IOI Mall New Location Grand Opening - Lot FS09-FS11"